Many people consider a two-wheel drive truck to be nothing more than a car with a really big trunk, and for the most part they’re right. Trucks were made to be workers. They were built for hauling, towing, pulling, and running over every muck-ridden terrain we could push them through. It only makes sense that the best trucks would be four-wheel drive. How much work could we possibly get done if we’re constantly pulling our vehicle out of the mud? 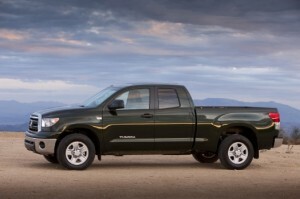 According to experts at all the top automotive research sources (Car and Driver, Consumer Reports, Edmunds, and Motor Trend), these are the best 4WD trucks for the 2010-2011 model years. A new, more powerful engine lineup has put the 2011 Ford F-150 at the top its class of four-wheel drive pickups. A new 3.7L V6 replaces the entry-level 4.6L V8. After that, there are three more engine choices: the 5.0L V8, a 365-horsepower twin-turbo EcoBoost V6, and the most powerful engine available in the F-150, the 6.2L V8 pushing 411 horses and 434 lb-ft. of torque. Not only is it more powerful, with a better towing capacity of 11,300 pounds properly equipped, it also delivers capable handling and a smooth, quiet ride. Higher-end models of the SuperCab and SuperCrew trims are luxurious in their interior styling, but cost well above the base price. The Ram also offers three engine choices for its half-ton frame, two V8s and a somewhat weak V6. Kick up to the V8 engines and you’ll get the five-speed automatic transmission instead of the four-speed that comes with the V6. That’s probably a good idea considering Dodge’s past issues with four-speed automatic transmissions. Its rear coil-spring suspension all but eliminates the harsh ride that previous models exhibit. Maximum towing capacity, when properly equipped, is an adequate 10,250 pounds, but it’s the storage space, powerful four-wheel system, and intuitively-designed versatility that make the Ram a top pick. The four-wheel drive and 5.7L V8 engine bring the Tundra’s max towing capacity to 10,800 pounds. Couple that with a six-speed automatic transmission with prompt, smooth shifting capabilities, and you’ve got a very reliable workhorse pickup. It can maintain speed up steep grades even when towing large packages, and is just as capable off-road as it is on. Steering is light but the suspension is slightly stiffer than competitors, making for a more vibratory ride at times. The interior received a refresh this model year, but it may be the one thing that brings the Tundra down lower than the Ram and the F-150 as it features a much less attentive design than previous models. Though it is smaller than the other models on this list, the four-wheel drive system of the Frontier makes it a top pick in the midsize class of pickups. It features a shift-on-the-fly system with 4-Hi and 4-Lo settings activated by a dashboard-mounted switch. The rear of the King cab utilizes reverse-opening doors to allow passengers access to rear jump seats. It is definitely not the most comfortable or roomy position in the truck, but does provide convenience if you need to haul a few people a short distance. The Utili-tack system in the rear is extremely convenient, offering dividers, trays, storage bins, and bike racks. For the price and the power, the Frontier can stand up to the big boys.